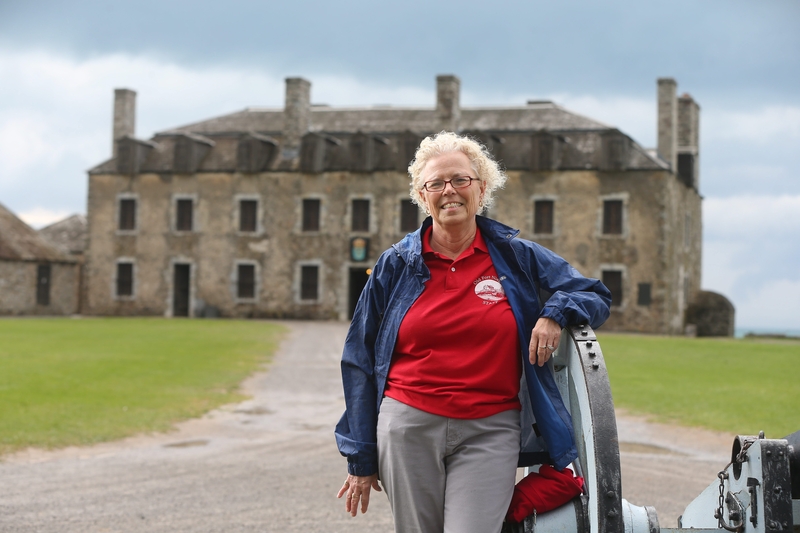 Elaine M. Hildreth, who was an elementary school teacher for 34 years, earns praise for her “cheerful disposition and love of history” as Old Fort Niagara volunteer tour guide. YOUNGSTOWN – Elaine M. Hildreth kids her friends that a decade after retiring from a 34-year career of teaching elementary school – mostly fourth grade – she still needs her “fourth-grader fix” once in a while. She satisfies that need to reconnect with students as a volunteer at Old Fort Niagara, where she sees hundreds of fourth-graders each year, who are learning local history as part of their curriculum. And, expanding her role as a lifelong educator, she finds herself entertaining questions from some of the fort’s 180,000 annual visitors of all ages and from all over the world. Volunteers and re-enactors contributed more than 35,000 volunteer hours in 2014, the equivalent of 16 additional full-time staff members at the fort, which is valued at more than $550,000 in comparable wages. Hildreth’s name has been added to a plaque honoring each Volunteer of the Year, which is displayed in the fort’s visitors center. It seems natural for a retired teacher to volunteer at the fort, but how did you get involved? I became interested because I’d bring my class to Old Fort Niagara every year on field trips. At the end of the year, I’d ask them their favorite field trip all year, and they always picked Fort Niagara. I retired in 2005 after 34 years at Huth Road Elementary School on Grand Island, but I’ve been volunteering at the fort for about 20 years now. I started with special events, like the Haunted Fortress and Candlelight Tours, volunteering nights and weekends. During the summer, I’d do some guiding. But once I retired, I got right into the tour guide thing. I know you serve as a tour guide and an instructor for new tour guides, but you also portray someone named Jean Lowry. Who was that? During the French and Indian War time – the late 1750s – this British woman named Jean Lowry was captured by the French and they brought her to Fort Niagara. They did a lot of what we now call “prisoner exchange,” trading prisoners and trading things for prisoners. This was very common at the time, between the British and Indians and French and Indians. She was only at Fort Niagara for 10 days, but she stayed a prisoner until the end of the war and she was very vocal. She wrote about it, and it was published, so she became kind of famous. When kids think of prisoners, they think of dungeons and people in chains, but she was treated very well. You said volunteering at the fort really feeds your “fourth-grader fix.” How so? When I need that fix, I go to the fort and give a tour. I miss seeing “the light go on” as a teacher, but I see it when I give tours to kids. And dealing with adults is different because they have a lot of preconceived notions, but I also get to see a light come on with them, too. They have their “aha” moments. And I help train tour guides and we have a lot of retired people, but a lot of college students who volunteer, too. I really enjoy working with the college kids. It keeps me young and aware of what’s going on in the 20-something world. I really enjoy meeting new people, especially when I am Guide of the Day, when I give short, 15- to 20-minute orientation tours for visitors every hour. I meet people from all over the world. Most come to see the Falls and then come to Fort Niagara. They are fascinating to talk to. Adults come in with preconceived notions of what our country’s history has been. It’s fascinating to hear their different points of view. What’s the most unusual question you’ve been asked? From the parade grounds – on a clear day – you can see Toronto (across Lake Ontario). I had someone (an adult) ask me if it was New York City. About the difference between the three flags we have on the parade grounds. We have the plain white French marine flag, the British flag from the time of the American Revolution, and the American flag from the War of 1812 time, with 15 stars and 15 stripes. What’s the best question a child has ever asked you? As you’re walking across the drawbridge to enter the fort, there are woodchuck holes in the earthen sides, and I’ve had kids ask me if they were holes from cannon balls. What other volunteer work do you do? I volunteer at the Care-n-Share Food Pantry in Ransomville once a month and with the book sales for the Friends of the Youngstown Free Library. The food pantry wouldn’t be in existence if it didn’t have volunteers. And volunteers are huge for the fort – it helps financially, because they get all of that volunteer help instead of having to pay employees. I think that it’s important for people to give back to the community, especially if they are in a position to do so. I had a wonderful career, and now I have the time to do this. I think people need to help the general population where they can. As a volunteer, you can sign up for tours you want to do and you can volunteer as little or as much as you’d like. My husband, Jim, used to work weekends, so that’s why I started volunteering on weekends. But now he’s retiring at the end of May and will volunteer in the lighthouse at the fort. He’s all excited about that. Know a Niagara County resident who would make an interesting question-and-answer column? Write to: Niagara Weekend Q&A, The Buffalo News, P.O. Box 100, Buffalo, NY 14240, or email niagaranews@buffnews.com.